My name is Francisco Gomez, from Colombia. I recently stumbled upon your blog and have become an avid reader of it, since I have always loved all things related to clothing, accessories etc. I am currently in the process of having my first bespoke suit made and wanted to ask you two questions regarding the process. The first question is regarding how to choose a tailor. Since it is my very first time, I don’t really know the things I should be looking for. I have already visited one tailor and he did spend almost three hours with me talking me through fabric matters, style matters etc. I clearly remember him asking me at the end what I had thought and I said I didn’t really know since I had nothing to compare it with. I felt that when I asked about the process of the construction of the suit, he was very superficial in the explanation. I would’ve liked a more in depth account of it, because otherwise it just feels like something any tailor could do (I forgot to mention I am visiting top tailors in my city who are, fortunately, priced way below say a Savile Row tailor). The second question is regarding a comment from you on trousers: you mention “It’s worth avoiding belt loops if you can, as this looks far smarter“. I agree with you style-wise. However, I was under the impression that a belt was a must if you were to dress properly. Can you help me out there? Is it OK to use no belt if you have trousers that are bespoke and therefore sit perfectly well on you? Thank you for your time and a big thumbs up for your blog! Is that floating canvas sewn together by hand? Again, all bespoke tailors should do this. Is an individual paper pattern made for you, rather than working for an existing block? This is a foundation of bespoke. It means it is not just an adjusted 38-chest model or similar. How many fittings will be required and how long will it take? This is more a general indicator. If it is promised in a day or two (as many Hong Kong tailors do) then it is not bespoke; equally if no fittings are required. These questions should establish whether you are working with a proper bespoke tailor. The choice between bespoke tailors is then largely one of personal taste, and a little of skill. The collar of the suit (perhaps the one he is wearing) sticks closely to the back of his neck. The back of the suit, particularly across the top half, is smooth, at least smoother than you would expect from a readymade suit. The armhole is higher than on a readymade suit. There are no other obvious pulls or folds on the front of the suit, suggesting it is too tight, or the balance is off from one side to the other, which you can see from buckling along the sides of the suit. The tightness across the chest, how much loose material or drape there is. No permutation is wrong, but they are different styles. The slimness of the trousers and sleeves, slimmer perhaps being more contemporary, less classic. A closer waist and shorter jacket could also be seen as more contemporary. Overall, which you prefer in terms of what he is wearing and what materials he suggests to you. You need to want the kind of things he shows you! Finally, you don’t need a belt to be smart. In fact, I would positively avoid wearing one with a suit. You can follow the discussion on Picking a tailor: Reader question by entering your email address in the box below. You will then receive an email every time a new comment is added. These will also contain a link to a page where you can stop the alerts, and remove all of your related data from the site. Simon, on the belt/no-belt issue, is it practical to wear trousers with no belt, side-adjusters or suspenders? Simon, is it alright to not wear a belt even if my suit trousers and other smart trousers have belt loops? Thanks. Perhaps best to wear a belt in that case. Or find a tailor that can take them off for you. Even better is to add side tabs on, but that means cloth taken from somewhere else on the trousers, such as inside the turn-ups. As for the belt thing, it’s quite easy in my opinion. If your trousers have loops (like most trousers do), wear a belt. If you can, get suit trousers with tabs instead and don’t wear a belt. I go to a tailor who does made to measure not bespoke. The results are very good and the cost is 189 pounds circa. This is if you bring your own cloth, with his cloth its about 250. I would strongly suggest using a tailor like this as to a tailor charging 1,000 pounds plus for bespoke. The results are minimal as regards things visible to the human eye. He wont do extra stuff like half belts or avante garde cuts. Id advise this over any stuff like M and S suits which could cost the same and as an alternative to expensive bespoke. I have a private bespoke tailor as well charging 40 pounds without material but have not seen too much difference.The idea of a belt I would go for over fasteners on the hips or sides which never seem to work well. Hi – where are you based, and could we know the name of the tailors? Bespoke has always been worth it over MTM in my experience, but of course it varies with the quality of both. That’s not particularly helpful – can you tell us why you don’t like them? I have a dozen pairs of trousers with them and think they are wonderful, for fit, style and everything else. @anonymous – I don’t believe you, as it happens. All my MTM suits (from Hackett…I’m working towards bespoke..) have side tabs (following Simon’s advice on the blog) and I would never, ever go back – style is one factor – the smooth lines of the suit look better than the contrasting belt/buckle in my opinion, but the fit and feel is the most important. After all, if you look at the inch or so gap between holes on a belt, it does rather undermine the point of having your trousers properly sized in the first place. I fnid a belt feels either too tight, or hangs limply off the front a little. I haven’t written off belts as there are some fine belts out there, like the intrecciato ones from Bottega Veneta, that give one’s formal attire that subtle umph/character. When getting suits, I usually consider which colours I would like to mix up with a belt now and again and then have side adjusters on the others. I’m usually in formal wear and I occasionally wear suit trousers (with belt holes) without a belt; well just a RTW pair I got from Daks a couple of years ago that fit like a glove! It constantly screams ‘wear me without a belt’ and of course I don’t give in often but when I do, I feel and look amazing. Regarding fused suits, you may find with a little more research that fusing works better with very lightweight cloth, 240gm/7.5 oz., etc. Why? Because canvas was designed to be used with heavy 380-700 gram cloth. In the old days nobdoy used the lightweight cloth that has become ubiquitous today. In other words, classic tailoring/tailors had no experience with the light weight fabrics of today and did not have the techniques to deal with them. Therefore, tailors today who are using the old techniques are using an antiquated method on the wrong product. Fusing today is very different that 30 years ago and can provide fluidity, form, and comfort at a very high level. Sometimes I just laugh at my customers who show up wanted a tropical weight suit and insist on full canvas. They will pay more for an inferior product. Thank you. I am aware of all this, of course, and have had both canvassed and fused tropical weight suits. The former have always been superior. 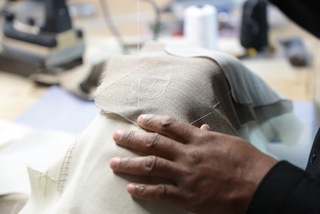 The French tailors, in particular, are masters of this after decades working with African clients. Thank you for reading, but this proves my point. One would need to find an extremely skilled “French tailor” or equivalent to make this work. It’s too risky for most people. A friend of mine used a Savile row tailor to make a 7 oz mohair/wool suit with full canvas. It cost 4,000 and was a disaster – very chunky and structured. I did not say that only the French can do it. Many others can. But if you go to a Savile Row tailor (apart from A&S and derivatives) and expect them to not produce a strong, structured suit, then you simply don’t know the tailors. The problem was not the cloth. For other tailors, look at Caliendo, Solito and the other Neapolitan tailors on this site. All of whom visit London. I think too much emphasis is placed on Bespoke vs. MTM. There is both good and bad in both categories. The fact of the matter is that most men with a “normal” shaped physique would be much better off with a high quality canvassed MTM garment; the fit will be great and the customer will have saved himself a lot of money. Also, why denigrate adjusting a pattern off a “block”? You don’t think the Savile row tailors start with a block when they make bespoke? They are all starting with a basic shape that they refine — it’s just that the level of refinement with hand work enables them to make more minute adjustments. When we do MTM we can adjust our block in more and 50 different ways in great detail. The bottom line is bespoke is a waste of money for most guys as the results will appear largely the same either way accept for the hand stitching, etc. By the way, why is hand stitching better? It’s actually not necessarily a better technique for strength, aesthetics, et. I’m afraid I disagree. I’m perfectly aware of how bespoke is cut, and indeed the variations. 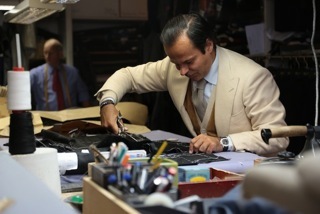 I have documented the making of and had bespoke garments made at over 20 tailors, including all the Savile Row names. I know exactly how they are all cut, and saying it comes from a block is a distortion of the word. There is a system, in 90% of cases originating with the Thornton system, but is entirely different from made to measure. MTM can only work in two dimensions. It cannot deal with a slight stoop forward and to the left. Bespoke works in three dimensions. Indeed, the biggest skill in bespoke is not the cutting, but the fitting and the re-cutting, moving an entire 3D image around by degrees. MTM cannot come close. I do not have an unusual body shape, but it makes a big difference. Show me someone with the same level of experience of bespoke makers, and I will have a conversation about the merits. And I make no case on hand stitching. In some places (putting in the excess on a sleeve) it makes a big difference; on others (buttonholes) it is merely a matter of beauty. Surly you must be familiar with the Bernhardt MTM system which allows for what you call 3D adjustments. Using the method we can deal with a dropped shoulder, hollow back, high left thigh, neck wrinkle, etc. Obviously you have a lot invested in the concept of bespoke, an emotional attachment that comes from thinking something that costs 4-8k must be vastly superior. But if the improvement of bespoke over MTM on a person is only 5-10% for three or four times the cost is it worth it? In some cases there is no improvement other than feeling good about all the hours that went into the hand making of the garment. This situation is not unlike wine aficionados who truly believe that a certain Chateaux or price must reflect the quality of the end product. However, many studies utilising blind tastings have confirmed that so called wine experts usually get it wrong. More often than not the cheaper wines in the blind tasting are judged superior. Let’s get 10 models who are all, say, a 40 regular, in the same cloth and style lined up in a range of bespoke and MTM suits and pick which ones we think are which. You’ll be guaranteed to be surprised. As long as the garment starts with the best cloth I bet you won’t be able to pick out only the bespoke models. Isn’t this the most important thing in the end? The perception of how if fits by third parties? We want it [the suit] to feel good on ourselves but more importantly we want others to admire us. Yes I am aware of the system and as you say, it is good but still not as good as bespoke. The changes you mention, apart from perhaps the ‘wrinkle’ are also still 2D. And bespoke in London can start at £900 and there are many under £1500. This is assuming the bespoke tailor knows what he’s doing. I would rather have a high quality MTM than a rubbish bespoke. I’ve bought bespoke that was not a great fit and I regretted not going off the peg. The issue I see it with the “no belt” appraoch is that it is fine if you have a slim waist;however if you have middle aged spread,are more portly, or have put on a little weight over Christmas, then the belt acts as some structural support for the waist of the trouser to prevent some rolling of the fabric – which is considerrably more unsightly than a belt. It’s my first, prolonged time visiting the website and on personal reflection, I find it poignant that tailoring in the London has to follow such stodgy and canonical rules to buying a personal suit. That you have to find a Savile Row tailor because he is the paragon of an impeccably well-made suit? That you have to spend an abhorrent amount of financial income and the austerity of not being allowed, or rather not being told to have belt loops and that you must, on many other aspects such as buying English made shoes. Do you want to look antiquarian? It’s bemusing because informal discussions that happen at the time of Pitti in Florence – the Italian and other non-European tailors such as those from Australia and New Zealand can immediate tell those who look like they’ve come from a Savile Row salon, primped from head-to-toe in bespoke suiting and all of its accoutrements. A suit is a living, and working one. To suggest a made-to-measure suit is inferior to a bespoke one is so factually incorrect and only serves a person’s vanity for men’s fashion elitism. Having had experience with Australian and New Zealand tailors, hand produced suit are fully tailored with the additional option of one fully hand-made. Suits are fully measured, made in Italian or New Zealand workshops with fabric cloths including: Zegna, Ariston, Holland and Sherry and shirt cloths by Thomas Mason. The greatest tragedy is to conform to set rules that you must have all the trimmings of a Savile Row suit. There are other tailors, such as JE Harvey Kelly who are more contemporary yet have the knowledge to cut a suit. Lawrence, your view of English tailoring is rather narrow. Our views on creativity are probably rather similar, but may I suggest that you try rather more bespoke tailors in Europe before you make such comparisons? I am currently studying tailoring in London, however am finding it hard to secure an apprenticeship. By any chance do you know any other countries that has a big tailoring apprenticeship tradition in the same way we do? Or if you have come across any tailors in Europe that have an apprenticeship scheme ? Most countries don’t have an official training course or bespoke association (as Newham College and Savile Row Bespoke do in the UK). You have to approach each individually. The only exception is the tailoring schools run by places such as Kiton and Brioni. But they are training people to make RTW, hand-sewn garments rather than bespoke. I recently switched to wearing braces instead of belts. It looks far smarter to not wear a belt with a suit or with a jacket and trousers. I removed the belt loops from all my trousers and added braces buttons. Simon, I read somewhere you consider braces “ugly”, I don’t agree. I never take off my jacket when I have braces on, not because I consider them ugly but because I realize they are not supposed to be seen. Also you never have to fix the position of the trousers. 1- Fused suit. In order to get a half canvassed or fully canvassed, it wil be much much more money and much more time, and most of the jacket tailors (chaqueteros – they use separate tailors for pants and jacket) do not know how to do the canvass (or are not willing to do it due the time involved in it). 2- Limited fabric selection. There is one place behind Atlantis, one place in Hacienda and one in the 97 con 11 that sell zegna, loro piana, english and italian fabrics. Tailors will have some of it but since most people do not care that much for the fabric, plus use only plain tones or striped, and stocking fabric is quite expensive, their selection is limited, most of it is from paños atlas (which is good in my opinion) or would order it, adding more time to the process. 3- They would make two or three fittings tops. Due to time and money constrains, not much fitting is done. After some previous false starts I’m, at last, going bespoke! I live in NY but travel to London once or twice a year. I don’t need any formal business wear; rather, I’m looking for smart (dapper?) alternatives to my standard gray trousers, navy blazer, Hermès tie. Most of my shirts are OTR T&A. I could try Paul Stuart custom; indeed, most of my clothing already comes from there or, I could pick a SR tailor, most of whom are coming here in the next few weeks. I could then follow up with them in London and get other fittings on their return visits to NY in the Spring (Huntsman, I hear, is opening a NY outpost). I already have a fairly keen idea of what PS Custom will do. But what about the London houses? I’ve spent some time trying to educate myself on the various house styles but other than the extremes of Anderson & Sheppard and Huntsman (if I’m correct in saying that), where can I go to get a really good idea of the house styles of Davies & Son, Kilgour, and Henry Poole? Realistically, I’m not going to get jackets made at each of these tailors and given that I’d like to start the process in NY it’s not like I can go to SR, pop in to each, and have a chat… A good resource would be most welcome. Lastly, what would you consider to be a nice blue blazer, gray trousers alternative? In brief, though, drape tailors like Anderson & Sheppard are the most different to anything else English. Others you mention like Poole, Davies etc are much more similar to Huntsman, only not often as heavy on the structure. Then there are those with very different styles (rather than construction) like Kilgour, Sexton and Chittleborough & Morgan. A quick look at my coverage of those or images online should give you a good idea of the style. It’s not where I’d start with my first bespoke though. Thank you for your thoughts. I suppose once one veers from the blue blazer/gray trousers uniform the rules relax a little and it starts to fall into the realm. I’m thinking of going with a green tweed with a subtle window pane. But it has to be versatile.